The Taiwanese are down with the food cart. They are everywhere. 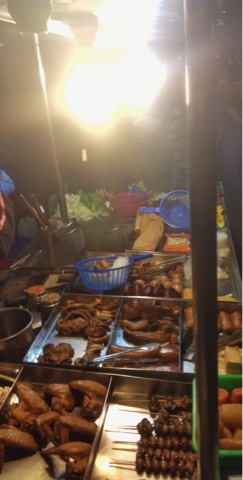 One of the more common types of carts in Taiwan is the mix and match style cart like this one. Basically you choose your own ingredients from the display. Chicken wings, chicken hearts, Vienna sausages, pork skin, pork slices, yam, carrot, tofu, yuba, pork intestine, boiled egg, greens, couple types of dried noodles. Some of these carts have a vast array of ingredients laid out. You place whatever you want with tongs in a plastic basket and the cart owner cooks everything for its appointed time in a vat of boiling broth. Then you season it how you like with chili, vinegar, soy, salt and pepper. You can get it dry or as a soup with some of the broth added. We were overjoyed to pass this cart on the way home from the bar one night and brought tubs of noodles back to eat while watching one of the many dopey action films on TV.